Most of the organic reactions occur through the involvement of certain chemical species.These are generally short lived and highly reactive and hence cannot be isolated.These short lived highly reactive chemical species through which the majority of the organic reactions occur are called reactive intermediates. Example: Carbocation, carboanion, free radical, carbenes and nitrenes. Chemical species bearing a positive charge on carbon and carrying six electrons in its valence shell are called carbocation. These are formed by heterolytic cleavage of the covalent bonds in which the leaving group takes away with it the shared pair of electrons. Carbocation are also formed during dehydration of alcohols in presence of conc. 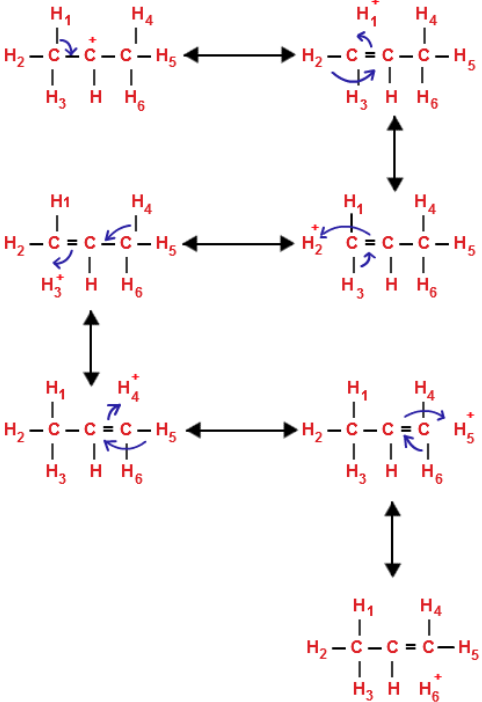 H2SO4 at 430-440 K.
Carbocation are classified as primary (1°) , secondary (2°) and tertiary (3°) according as the positive charge is present on a primary, secondary and tertiary carbon atom. An alkyl group has +I effect .When an alkyl group is attached to a positively charged carbon atom of a carbocation , it tends to release electrons towards that carbon.In doing so, it reduces the positive charge on the carbon.In other words, the positive charge gets dispersed and the alkyl group becomes somewhat positively charged.This dispersal of the positive charge stabilizes the carbocation. Stability decreases as +I effect of the alkyl group decreases. Carbocations in which the positively charged carbon atom is attached to a double bond or a benzene ring are stabilized by resonance. The presence of electron-donating group such as -CH3, -OCH3, -OH in the benzene ring increases the stability while the presence of electron withdrawing group such as -NO2 ,-CN , -COOR , -Cl decreases the stability of the carbocation. For CH3+ carbocation, no hyperconjugation occurs. Carbocations are highly reactive chemical species since the carbon atom carrying the positive charge has only six electrons in its valence shell and thus has a strong tendency to complete its octet. The order of reactivity of any chemical species is reverse that of its stability. The carbocation are planar chemical species. The carbon atom carrying the positive charge is sp2 hybridized. The three sp2– hybridized orbitals of this carbon form three σ-bonds with monovalent atoms or groups which lie in a plane and are inclined to one another at an angle of 120°. The unhybridized 2p-orbital which is perpendicular to the plane of the three σ-bonds is however empty. Could you please provide your notes in hindi as well.